Slow down and obey all traffic laws and speed limits, both in school zones and in neighborhoods surrounding the school. Comply with local school drop-off and pick-up procedures for the safety of all children accessing the school. Avoid double parking or stopping on crosswalks to let children out of the car. Double parking will block visibility for other children and other motorists. Visibility is further reduced during the rain and fog seasons when condensation forms on car windows. Avoid loading or unloading children at locations across the street from the school. 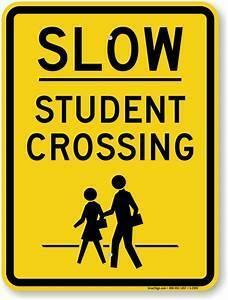 This forces youngsters to unnecessarily cross busy streets---often mid-block rather than at a crosswalk. Stop for a school bus with its red overhead lights flashing, regardless of the direction from which the driver is approaching. Drivers must not proceed until the school bus resumes motion and the red lights stop flashing or until signaled by the school bus driver to proceed. Watch for children walking or bicycling (both on the road and the sidewalk) in areas near a school.